After Saturday’s result, Yale leads the all-time series with Dartmouth 39-34-6. Last season, the two teams met on Oct. 11, when Dartmouth won handily 4-1, extending its unbeaten streak at the time to eight games. The Bulldogs have won only one game this season, in large part due to its poor defensive effort. Yale and Cornell University are tied for the bottom spot in the League standings, and Yale sits last in goals allowed per game with 2.46, almost a full goal more than the University of Pennsylvania, which sits second to last with 1.63 goals allowed per game. In contrast, Dartmouth has allowed just seven goals in 10 games this season. Across the duration of the contest, Yale put together a sturdy defensive effort and tested the resolve of Dartmouth’s offense, holding the Big Green scoreless in the first half. Seven minutes after the halftime break, though, Sam Rosen ’16 registered the first Ivy League goal of his career, popping it over Yale’s goalkeeper and into the net. The Bulldogs attempted to rally but were unable to get past Dartmouth’s defensive line and goalkeeper Stefan Cleveland ’16, who now owns five shutouts on the season and holds the highest save percentage in the Ivy League at 0.861. Cleveland was only forced into three save situations against Yale, but two came in the last seven minutes. Dartmouth out-shot Yale 12-to-6, putting six shots on target compared to the Bulldogs’s three. The offensive firepower did not kick in for Dartmouth until the second half as Yale limited Dartmouth to just four shots in the first period. The Bulldogs, however, could not capitalize, testing Cleveland just once. Yale freshman forward Kyle Kenagy leads the Bulldogs with three goals and nine shots on target on the season but could not find his form in the match and managed to get just one shot off in the 83rd minute, which Cleveland saved. The Big Green also racked up nearly double the number of fouls as Yale, 19-to-10. The total was Dartmouth’s second highest of the season, two short of the Big Green’s 21 against the University of Washington on Sept. 18. With Rosen’s second goal of the season, he is tied with three other teammates for the team lead in goals. Dartmouth has found contributions from all over the pitch this season with 10 players registering at least one score. Indicative of the high stakes and razor slim margins in Ivy League matchups, both of Dartmouth’s wins over Ancient Eight opponents came through a 1-0 score. The Crimson is the only other undefeated team in the conference. The two teams will not face off until Halloween weekend, but as the two teams separate themselves from the pack early, the story-line will only continue to build. 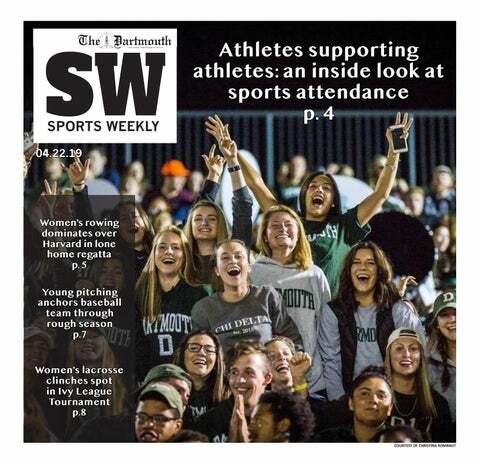 Riley emphasized Dartmouth’s game-by-game approach. Next week, the Big Green hit the road again, this time for a road tilt against the University of Pennsylvania in Philadelphia, with kickoff is 7:30 p.m.